This paper reviews the intelligence so far gathered as a result of XXXXXXXXXXXXXXXXXXXXX that there might be an atomic site near Beersheba in the Negev Desert in Israel. The information about the site has now been amplified, and, in addition, some Israeli importing activity with significant implications has been brought to light. 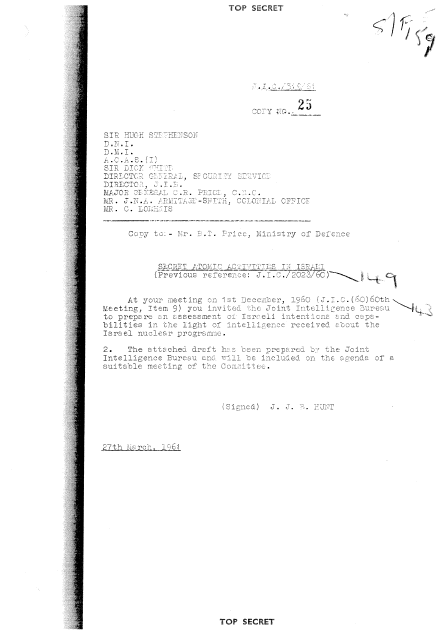 Our information about plans for French atomic aid to Israel suggests that these may have been more extensive than has been admitted. It is possible that in the pre-de Gaulle period the French were prepared to go further than they are now. A number of links are found to exist in Israel between atomic energy and the Ministry of Defence, and various Israeli statements relevant to Beersheba are found not to have told the full truth. 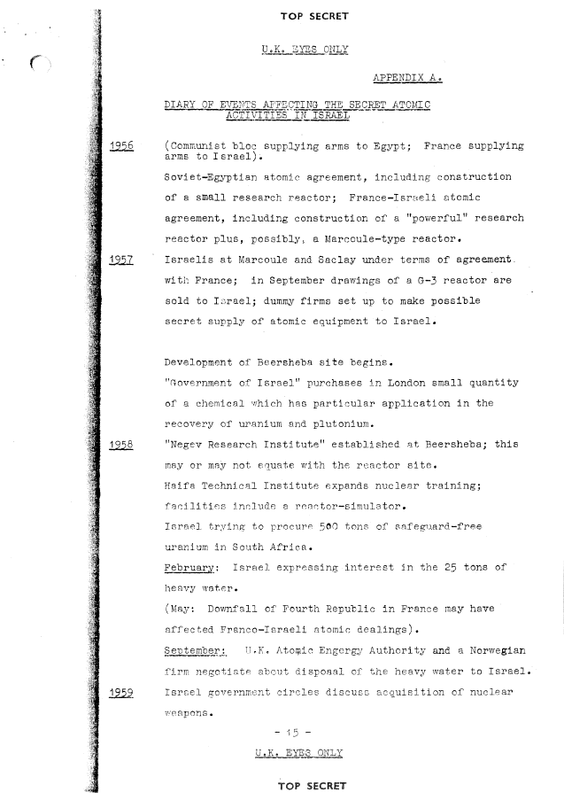 The paper c0ncludes that Beersheba is indeed an atomic site and represents the start of a wider atomic programme which ma;y well have included plutonium production. It is found that the Israelis tried to cover up these activities by secrecy and by deception. It seems more likely than not that the Israelis were trying to put themselves in a position to make a nuclear weapon should they decide to do so, though no development of her present program could produce an Israeli nuclear device before 1964.